When the delegates to the MD5 Convention sang the words, “Happy days are here again!” no one would have agreed more than me! As convention chair for the convention, the past year has been challenging but rewarding, as 17 Lions from the Fargo Lions Club, NDSU Campus Lions Club, and Horace Lions Club volunteered to serve as the Steering Committee to help me bring the 2015 MD5 Lions Convention to fruition. Opening flag ceremony at MD5 Convention. I told the Steering Committee regularly that they were the reason why this convention was going to be a success and they proved me right. From start to finish, we believe we provided a high quality convention for the participants that will be long remembered. My sincere thanks go out to each and every one of them for their dedication and friendship. Our international guests were ID Larry and Jane Dicus from California. PDG Mel Olson presents ID Larry and Jane Dicus with special gifts from MD5. I have gotten to know ID Larry over the past year while serving on the International Board and he is a Lion of high moral character. He believes strongly in what Lionism is all about and his work to build a relationship between Special Olympics and Lions Clubs International is noteworthy. 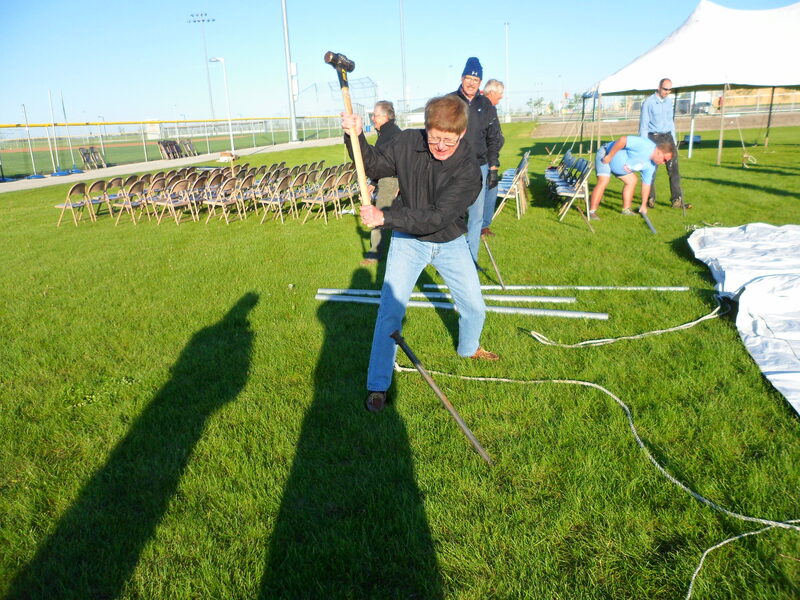 While in Fargo, he and Jane were able to visit a local “Opening Eyes” event for Special Olympics and he persuaded about 20 Lions to get up early on Saturday morning to go pitch 4 tents for the Special Olympics event–by the way, those tents were 20 by 40 feet in size! ID Robert takes a turn at driving in the spikes to support the tents. 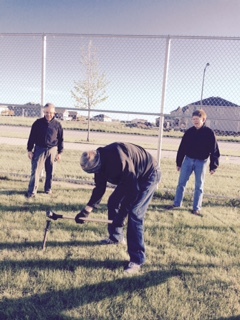 Eagle-eye Kevin Vannett hits the mark while pounding a stake as PDG Doug Scheller and ID Robert look on in awe! The programs at the convention were excellent, focusing on building teamwork, using technology, and transforming clubs to meet the challenges of a new generation of Lions. One of the special events was the Memorial Service that recognized 115 deceased Lions. Those who attended remarked that it was one of the most memorable. ID Robert sang “Friends” at the Memorial Service held at Bonanzaville. Leo Rally participants at the MD5 Convention in 2015. The trees were planted by the Leos as a memorial grove in the Lions Conservancy Park in south Fargo. The Leo Rally was a first for MD5 and the participants gave the effort high marks. 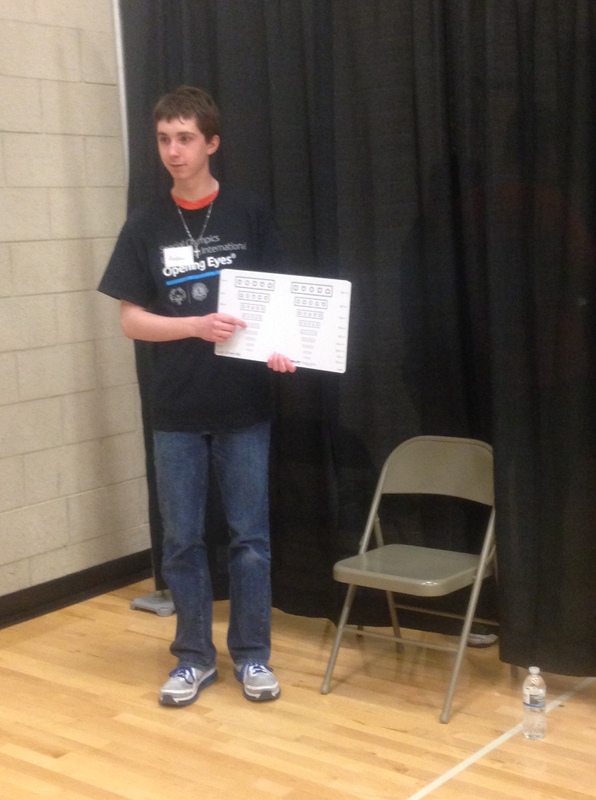 Leos were involved in the program and their impact on everyone was significant. 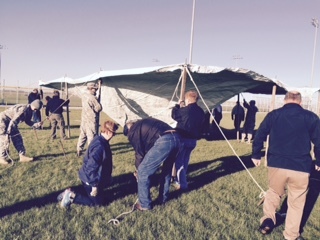 Leos were involved in programs to strengthen teamwork, communication skills, and leadership. The international awards were presented by ID Larry Dicus and Council Chair Ken Wetz. Presidential Certificates of Appreciation went to Keith Zeutschel (Horace Lions Club), Paula Swanson (Fargo Lions Club), Blake Strehlow (Fargo Lions Club), and Jade Monroe (NDSU Campus Lions Club). Lion Jade adds Presidential Certificate of Appreciation to her growing list of Lions recognitions. Leadership Medals were presented to: Tom Marquardt (Watertown, SD), Julie Schwartz (Bismarck Prairie Rose Lions Club), Delwyn Hager (GF South Forks Lions Club), and Dennis Becker (Burstall Lions Club). Lion Julie Schwartz receives long-deserved Leadership Medal from ID Larry Dicus. Presidential Medals went to: Ken Gifford (Rapid City Rushmore Lions), Patricia Vannett (Mandan Lions Club), Raymond Schley (Sioux Falls Downtown Lions Club), and Lorne Olver (Kipling Lions Club). 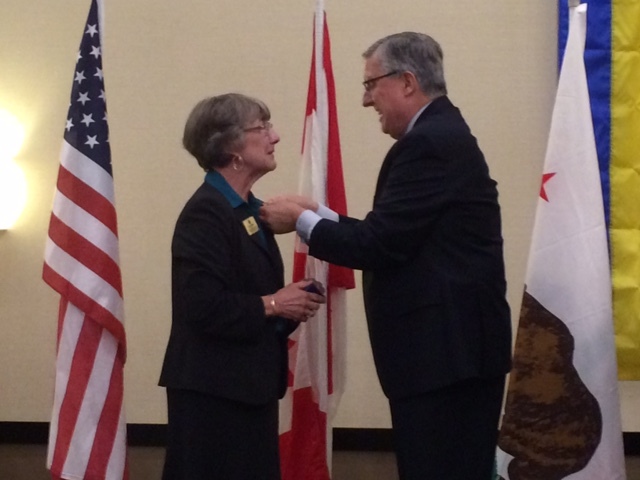 PDG Pat Vannett is recognized for her leadership and service with the President’s Medal. Conventions are all about reconnecting with old friends and starting new relationships. We were fortunate to have two Past International Directors and their spouses along with two current Directors in attendance. The International Family in attendance is pictured here. One of the most important parts of the convention was the symbolic transfer of leadership to the new District Governors Elect. The Red Jacket Ceremony is a special tradition in Multiple District 5. The DGEs are escorted to the front by the current DGs and they receive their Red Jacket as the mantle of leadership in front of their peers and supporters. The 2015-2016 class of DGs promises to be a great group of leaders who will move our Multiple District forward on many fronts. DGEs (L-R): Jerry Voss (SE), Judy Beaudry (NW), Chuck Edwards (SW), VDG Trainer PDG Leo Grossman, DGE Eunice Cameron (SKS), Garry Jopko (SKN), and Rick Swenson (NE). In addition, our Multiple District leadership passed from CC Ken Wetz (SW) to CCE Arlen Fetch (NW). CCE Arlen Fetch (L) is inducted by CC Ken Wetz at the final Governors’ Banquet. In closing, last year, Kathy and I were supported by wonderful people who gave so much effort to help us receive the endorsement to run for International Director. One of my NDSU students recently wrote that so much in life is based upon chance: If this had happened, then something else would have occurred. I am so grateful that so much effort was expended on our behalf because our first year of service on the Board of Directors has been such a wonderful gift. We have done our best to make the most of this opportunity and we have given our all to represent the Lions of MD5 and the world. Thank you most sincerely for what we have been given.